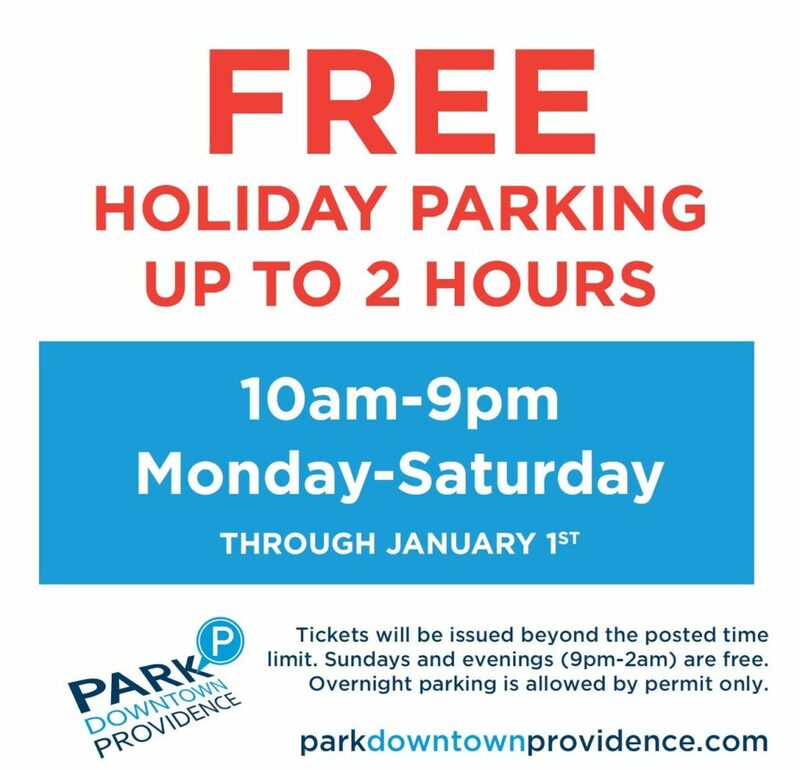 This holiday season, park downtown for FREE for up to 2 hours! Once again the city is offering FREE on-street metered parking in select shopping districts Monday through Saturday between 10 AM and 9 PM. The program begins the day after Thanksgiving, Friday, November 23rd, and runs until New Year’s Day, Tuesday, January 1st. As always, metered parking is free on Sundays. By offering free parking, the city encourages everyone to support local businesses. Make sure to follow the rules though! The 2-hour parking limit will be strictly enforced, and customers still must pay (by coin, credit card, or Passport app) between 8 and 10 AM. Within Downtown Providence, the specified area is bounded by Fountain Street, Memorial Boulevard, Weybosset Street, Empire Street, and Friendship Street (between Dyer Street and Dorrance). Download the map to see the specific streets, and please note that Exchange Terrace is NOT included in the holiday program. Also be aware that in other districts such as Atwells Avenue, Broad Street, Hope Street, Thayer Street, and South Main Street, meters are only enforced until 6 PM. Find more details at providenceri.gov, and look for the stickers on designated meters!